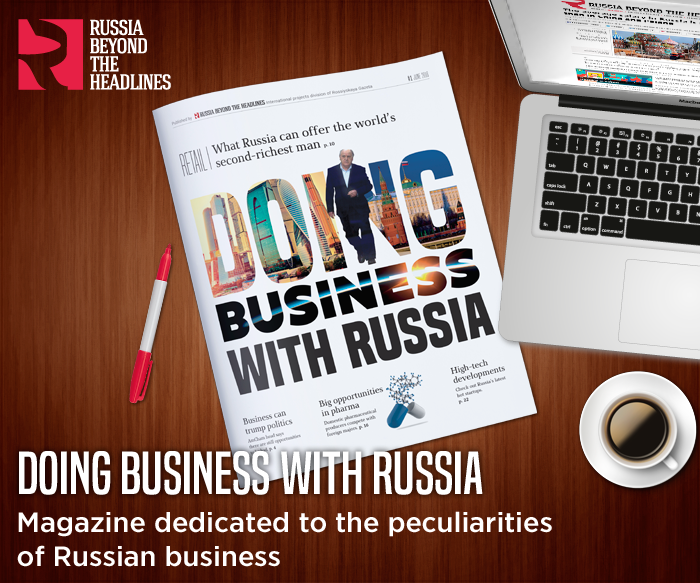 The first printed edition of the business magazine Doing Business With Russia was unveiled on June 8. Doing Business With Russia was created by Russia Beyond The Headlines (a multilingual media published by the newspaper Rossiyskaya Gazeta) with the support of the Trade Representation of the Russian Federation in the United States. The magazine covers the specifics of doing business in and with Russia. Its mission statement is to strengthen business ties between the Russian and international business communities. The first digital issue of the magazine was released in English for American audiences, and presented at the Russia: Start-Up-Grade Business Forum in New York (USA) within the framework of RBTH’s “Russia Beyond The Oil” panel discussion on April 13, 2016. The first printed edition was later distributed at the BIO International Convention on June 8-9, 2016, in San Francisco. The product is also due to be presented at the International Economic Forum in St. Petersburg on June 16-18, 2016. “The main purpose of the project is to highlight the attractiveness of the Russian market for foreign businesses through examples of specific companies. In terms of content, the magazine is in line with US business publications and business journalism traditions,” says Alexey Lossan, Doing Business With Russia Executive Editor. When the first issue was put together, continues Lossan, the decision was taken not to limit the coverage to Russian companies entering foreign markets, but to give examples of foreign investors successfully attracted to Russia. One of the articles in the publication is devoted to the relocation of a clothes factory from China to Russia, and another traces the activity of European investors in Russian agriculture. Specific cases are accompanied by interviews with key figures from the world of government and business, among them Russian Export Center head Petr Fradkov, Russian Venture Company CEO Igor Agamirzyan, and American Chamber of Commerce in Russia President Alexis Rodzianko. The “Special Report” section in the first edition of Doing Business With Russia is dedicated to market technologies and the development of start-ups in Russia. Future editions will delve into the development of specific sectors and regions in the country. RBTH plans to evolve the project by adapting the content to different countries, industries, and audiences. The magazine will be distributed in both digital and printed form: at international industry events; inside printed media of RBTH partners; by direct mailing to representatives of business, industry, and diplomacy; on RBTH and partner companies’ digital platforms. Thai and French versions of the magazine are in the planning stage.